Set of 2 replacement filters. Will fit the following Berkey systems: Travel Berkey, Big Berkey, Royal Berkey, Imperial Berkey, Crown Berkey, Berkey Light. 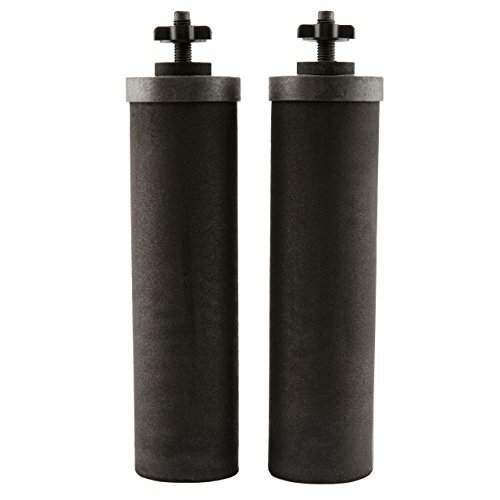 Black Berkey Purification Elements are more powerful than any other gravity filter element currently available. In fact, we tested the Black Berkey purification elements with more than 10,000 times the concentration of pathogens per liter than is required by standard test protocol. This concentration of pathogens is so great that the post filtered water should be expected to contain 100,000 or more pathogens per liter (99.99% reduction - the requirement for pathogenic removal). Incredibly the purification elements removed 100%. Absolutely no pathogens were cultured from the effluent or were able to be detected, even under an electron microscope, setting a new standard in water purification. Black Berkey purification elements are so powerful, they can remove red food coloring from water without removing the beneficial minerals your body needs. Virtually no other filtration element can duplicate this performance. The powerful Black Berkey purification elements also remove or reduce viruses, pathogenic cysts, parasites, harmful or unwanted chemicals such as herbicides and pesticides, VOCs, detergents, organic solvents, trihalomethanes, cloudiness, silt, sediment, nitrates, nitrites, heavy metals, foul tastes and odors, yet they leave in the healthful and beneficial minerals that your body needs.